In the most recent SCI Record Book (Edition XII), there are 37 pages of entries for Cape Buffalo (approximately 2,600 entries) and only 1-1/2 pages for Nile Buffalo (102 entries). Most of the Nile Buffalo entries (75) are from Sudan, and the second most are from Ethiopia which has the most bottom entries (8 of the bottom 10, for example). Now comes Uganda to re-write the record books at the top! 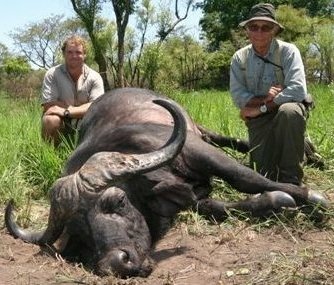 In fact, Uganda is now THE PLACE to hunt Nile Buffalo. 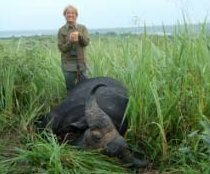 In our April Newsletter, Ken Wilson's hunt in Uganda for Nile Buffalo (and other species) was featured. 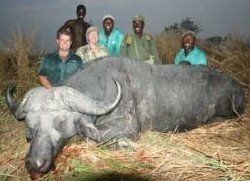 In this issue, we will feature the photos of a few more Nile Buffalo shot by clients of Uganda Wildlife Safaris, Ltd. in 2010 including two short stories from hunters interviewed by Ken Wilson (president of Sportsmen on Film and the North American booking agent for Uganda Wildlife Safaris). Richard hunted 2x1 with Don Black. Their PH was Keith Charters. 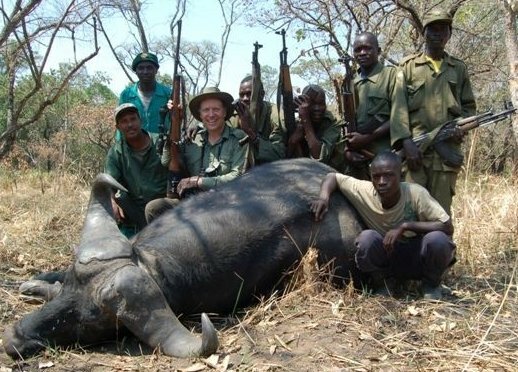 Early in their hunt, they tracked close to a bull that bolted before Richard could get a shot off. On the fifth day, they followed the tracks of a lone bull for 2-1/2 hours before seeing him partially hidden at 75 yards. It was later determined that Richard's first shot hit the bottom of the heart, but the bull came for the hunters ..."loping ... not really charging ... obviously badly hurt." Richard held off shooting, but as the bull got closer (and with Keith at the ready), both Richard and Don fired and the bull went down at 10 yards. Jim hunted 2x1 with Dave Bahl. Their PH was Johnny Chipman. After their tracker found the tracks of 3 bulls, they followed for an hour and suddenly came upon all 3 at 100 yards. Jim could see all of one, part of another, and none of the third bull. He shot the broadside bull in the shoulder which immobilized it. Then he and Johnny moved closer for the finishing shot. After photos and trophy/meat care, the team walked out and got soaked by a torrential downpour. Go to www.sportsmenonfilm.com and click on "Uganda" for price and trophy information. Click on "Hunting DVDs" to order the DVD titled "Safari to Uganda" or any of Sportsmen on Film's 67 titles. All DVD's are still priced at $19.95 and quantity discounts are still offered. Or call Ken Wilson at 830-792-4200 to discuss hunting Uganda, Angola, Namibia, or Europe (including 13 species of Capra and 5 species of Ovis).